Price: DVD $? ?, Blu-ray $?? 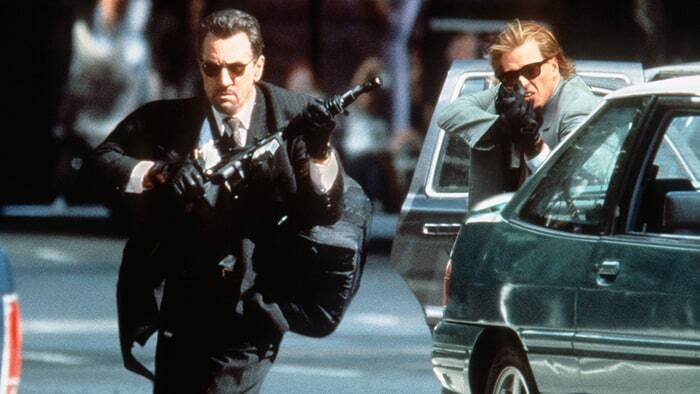 Al Pacino (Scarface) and Robert De Niro (The King of Comedy) drive the powerful and complex 1995 film Heat. In the wake of a precision heist of an armored van, the crew of a fierce, professional thief (De Niro) and an obsessively driven LAPD detective (Pacino) are locked in deadly opposition as they vector towards each other. As the stakes escalate and their lives begin to unravel, the crew initiates its most dangerous and complex heist. Taking inspiration from the late Chicago police detective Charlie Adamson – who killed the actual Neil McCauley (De Niro’s character) in a shootout in 1963, Heat was the culmination of years of research by Mann resulting in its depth and range of characters and choreography of action. The movie also features a strong supporting cast that includes Val Kilmer (Twixt), Tom Sizemore (Red Planet), Ashley Judd (Dolphin Tale), Amy Brenneman (Mother and Child), Diane Venora (All Good Things), Natalie Portman (Black Swan) and Jon Voight (Deliverance). Scene 148/147 – Where’s Anna?